“Work’s never hurt me”: The life of Willie R. Barnes. Wilson Daily Times, 24 April 1995. In the spring of 1995, the Daily Times profiled Willie Roscoe Barnes, 84, long-time proprietor of Wardrobe Cleaners. He passed away the following year. Willie R. Barnes began working at Wardrobe in 1923, when he was 13 years old. He was an only child whose mother died when he was 6. His paternal grandmother reared him. He attended Wilson Colored Graded School through third grade, then he “had to get out of there and go to work.” He first delivered groceries for H.W. Baxter’s store at Pender and Nash Streets. His second job was in a wood yard. He then went to work for Jim Barbour, whose Wardrobe Cleaners was across the street from Baxter’s. At age 18, Barnes started dry-cleaning clothes. He eventually married Barbour’s widow. He served in Morocco and Italy during World War II and at one point was assigned to guard Winston Churchill in Marrakech. After the war, Barnes returned to Wilson, and he and his wife built a new facility on one of eight lots they owned on Elvie Street. The new cleaners faced Pender. After his first wife died, he married a woman named Clementine. They live in a house they built on Elvie adjacent to the cleaners. He scorned the quality and durability of modern fabrics. He took up golf and joined the advisory board of Wedgewood Golf Course. Long-time neighbor and customer Bertha H. Carroll noted that Barnes believed in helping people. Long-time friend Herbert Woodard Sr., 87, said he and Barnes shared an interest in sports going back to the 1930s, often traveling to New York together to watch prize fights and the Yankees. In the 1930 census of Wilson, Wilson County: at 1005 Atlantic, owned and valued at $2000, Nancey Barber, 30, widow and presser at pressing club; son James D., 14; widowed mother Linna Carroll, 63; and lodger Willie Barnes, 21, tobacco factory cooper. In the 1940 census of Wilson, Wilson County: at 1005 Atlantic, pool room owner Daniel Carroll, 27; wife Lenora, 24, sewing; widowed mother Lina, 76; sister Nannie Barber, 40, owner of pressing club; her son James Barber, 23, presser at pressing club; and roomer Willie Barnes, 28, pressing club tailor. On 7 January 1957, Willie R. Barnes, 47, parents unknown, married Clementine Rogers, 46, daughter of Will and Carrie Rogers, in Wilson. “grandmother” — Henrietta Farmer Lloyd died 16 December 1961 at Mercy Hospital. Per her death certificate, she was born 1 August 1886; her parents were unknown; she resided at Barnes Rest Home, 626 East Vance; and she was a widow. Informant was Willie R. Barnes, 732 Elvie Street. Jim Barbour — James Daniel Barbour died 23 September 1959 at Mercy Hospital. Per his death certificate, he was born 19 September 1915 in Wilson County to James Barbour and Nannie Carroll; never married; resided at 1005 Atlantic Street; worked as a presser at Wardrobe Cleaners; and was a World War II veteran. Informant was Daniel Carroll, 715 Elvie Street. “Barbour’s widow” — Barnes did not Barbour’s widow at all, but his mother Nannie Barbour (and per James Barbour’s World War II draft registration, she owned Wardrobe Cleaners.) Nannie Barbour Barnes died 13 April 1956 in Wilson. Per her death certificate, she was born 7 October 1897 in Henderson, North Carolina, to Daniel Carroll and Lina Coppedge; and worked in dry cleaning. The informant was Willie R. Barnes, 1005 Atlantic. Bertha H. Carroll — Bertha Bryant Hawkins Carroll’s husband Daniel Carroll was the brother of Willie Barnes’ wife Nannie Barbour Barnes. 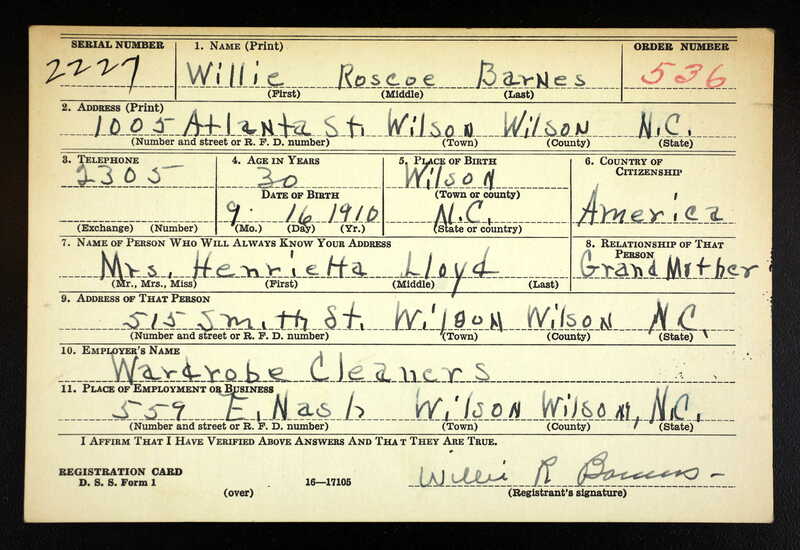 Willie R. Barnes registered for the World War II draft in 1940.